Much like for Titan Returns, after the preview night at NYCC 2015, Hasbro has uploaded the CG renderings and official stock photography for the upcoming Warrior, Legion and Minicon class toys from the Robots in Disguise line. Included in the images mirrored below are Fracture, a different Megatronus than what we've already seen, Optimus Prime in 'Arctic Camo', Stealth Drift, Thunderhoof, Quillfire, Night Strike Bumblebee; Legion class Blizzard Strike Optimus Prime (totally different from Arctic Camo, we swear) and Ratchet; Minicons Windstrike and Blu. Check them out, and compare them to the galleries from the event right here! They are perfect CG renders I think. Definitely going to get those Mini-cons. I want to repaint the sword one and give him to Thundertron. I love smaller Transformers that become weapons for larger Transformers. The Warrior Decepticons are probably a buy too. Quillfire, Thunderhoof, and Fracture for sure. So we get one Megatronus with face mask and one without? Welp, I'm getting the Toys R Us one then. He looks so much cooler with the mask on. So will Hasbro have done the "Fan mod" to Warrior Optimus then to allow his arm covers to swing back like they are in the render then ? 1) Will the two new Minicons come with clip on armour pieces too ? 2) is the port size the same as the pin-point posts on the Titans Returns toys - suggesting you could decorate then Titan toys with the armour from the RID-15 Minicons if you wanted too ? So are those big Cons. I can't decide what I think about the black Minicon... as a weapon, it's a wha??? But he'se cool. In bot mode he reminds me of the igor guy from DoTM and his "weapon" sure looks like something that would be roaming Unicron's interiors. All three cons look amazing, but I think I'll be skipping the Autobot repaints. Flashwave wrote: I can't decide what I think about the black Minicon... as a weapon, it's a wha??? But he'se cool. In bot mode he reminds me of the igor guy from DoTM and his "weapon" sure looks like something that would be roaming Unicron's interiors. I think he's supposed to be a wrecking ball fist with a face, so yeah! Fracture is a buy for me. Not so much anything else. And CG Renders, seriously? Overly Photoshopped promo images not enough anymore? I wait almost a year for more Warrior Decepticons to keep Steeljaw company, and four come along at once! I'll be getting all four of those Decepticons, though I am a bit sad that Legion Ratchet is a repaint, that implies that Ratchet won't be in the Robots in Disguise show. Mkall wrote: And CG Renders, seriously? Overly Photoshopped promo images not enough anymore? Started back at Toy Fair. They eventually get replaced by photoshoped production images, but it takes awhile. Not sure how much they use pro-painters like Etips One these days, as the stuff on the show floor is certainly not done up by a pro. 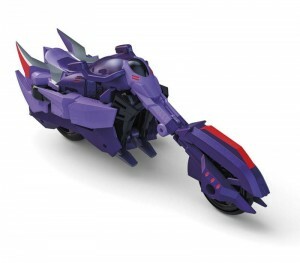 Megatronus I really would love him to just have the fask mask on, simply because I can pretend hes a new character. Quillfire shall be henceforth known as trollface and the weaponmaster gimmick should have been what minicons were about from the beginning of this line. I'm sorry if people have already stated this, but when I first looked at Quilfire's alt mode, I thought he was a repaint of a TF Prime Bulkhead deluxe. HE LOOKS JUST LIKE BULKHEAD IT'S AMAZING. SillySpringer wrote: I'm sorry if people have already stated this, but when I first looked at Quilfire's alt mode, I thought he was a repaint of a TF Prime Bulkhead deluxe. HE LOOKS JUST LIKE BULKHEAD IT'S AMAZING. When word came from "On High" that some old faces in TF Prime (which coincidentally would coincide with Prime Wars...) would crop up in Season 2, and Quilfire's general build was revealed, a lot of people speculated Bulkhead to be one of the returning cast, since it would be an easy digital reshell to give the Quillfire model a new head and ditch the back spikes. Not surprising since he looked like that in the show. I am very pleasantly surprised by Quillfire, he looks way cooler than I thought he could. And woohoo for Thunderhoof and Fracture! At the NYCC 2015, Hasbro did mentioned about Generations, RID2015, and Rescue Bots. But last night, it seemed to be that, they only seemed to focus on Generations that day. Does that they will never present RID2015, and Rescue Bots for this event? Or they will still present RID2015 and Rescue Bots, but just separate days instead of one altogether? Is that the main reason why other characters like Windblade and Clampdown still haven't show up yet, even though Hasbro have already released in image of what Clampdown do look like in both modes? Though not a perfect fit I'd not mind a Deluxe Bulkhead made out of Quillfire if feasible. as at least it would be likely to have a proper head unlike that odd one the Beast Hunters version has. (Did anyone ever make a suitable replacement for that head ?) even the silly one with 'Viking horns' on was better than the Deluxe had. 4,015 pages were recently viewed by 868 unique visitors. This page was viewed 1 times on Thursday, April 25th 2019 8:43am CDT. © 2019 Seibertron, Inc. DBA Seibertron.com. All Rights Reserved. Established June 2000. Seibertron.com is owned by Ryan Yzquierdo.